Sen. Heidi Heitkamp (D., N.D.) announced Thursday she will vote against Brett Kavanaugh's confirmation for the Supreme Court. 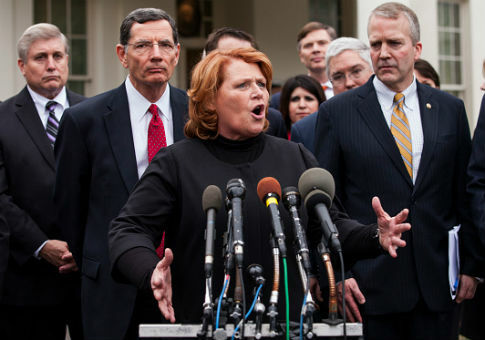 Heitkamp was one of three red-state Democrats up for re-election, along with Sens. Joe Donnelly (Ind.) and Joe Manchin (W. Va.), who voted for Supreme Court Justice Neil Gorsuch's confirmation last year, but she told WDAY News she would oppose Kavanaugh. "The process has been bad, but at the end of the day, you have to make a decision, and I've made that decision," she said. "I will be voting no on Judge Kavanaugh." WDAY News said it would have more details of its interview with Heitkamp later on Thursday. In a statement, Heitkamp said Kavanaugh's testimony in front of the Senate Judiciary Committee called into question his "temperament, honesty, and impartiality." The decision comes at a perilous time for her re-election chances, with two consecutive polls showing her trailing Rep. Kevin Cramer (R., N.D.) by double digits. President Donald Trump carried North Dakota by 36 points in 2016. The North Dakota Republican Party released a statement saying "Heidi Heitkamp just sided with liberals Chuck Schumer and Nancy Pelosi" to obstruct Trump. "Heidi Heitkamp just failed North Dakota, and voters know it. This race is now between a candidate who will be a voice for North Dakota and another candidate who politicizes every issue and staunchly opposes President Trump at every turn," the GOP said. "Given that a majority of her constituents want this exemplary nominee confirmed, Heidi Heitkamp is on the wrong side of history, and this will be the last consequential vote of her career." Kavanaugh's confirmation process was rocked last month when Christine Blasey Ford emerged to accuse him of sexually assaulting her at a house party in the early 1980s. Kavanaugh denied the charge, and the two testified in front of the Senate Judiciary Committee about the allegation last week. Two other women, Deborah Ramirez and Julie Swetnick, also came forward last month to accuse him of sexual misconduct, although there is no direct evidence or witnesses to corroborate their claims. Swetnick's story changed over time, originally claiming Kavanaugh was involved in spiking girls' drinks and gang rapes at high-school parties but then walking those accusations back in a subsequent interview. Donnelly has also announced he will oppose Kavanaugh's confirmation. Democrats need unanimous opposition to Kavanaugh, plus two "no" votes from Republicans, to defeat his confirmation. The only remaining undecided Democrat is Manchin, who has indicated potential support for Kavanaugh by pointing to his reputation after college. "I can understand also a person [Kavanaugh] who from 22 to 53, how he’s conducted his life, how he took care of his family, how he basically approached his job in a responsible manner," he said. "I’m not hearing anything from the 30 years as an adult, in his professional life." UPDATE: 2:41 P.M.: This article was updated with Heitkamp's full statement. UPDATE: 7:31 P.M.: This article was updated with a statement from the North Dakota Republican Party. An earlier version of the story mistakenly said it was a statement from the Cramer campaign. This entry was posted in Politics and tagged Brett Kavanaugh, Heidi Heitkamp, Joe Donnelly, Joe Manchin. Bookmark the permalink.